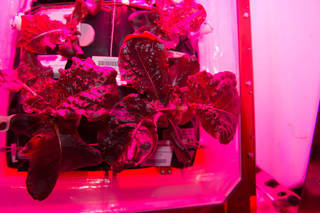 Astronauts on the International Space Station are ready to sample their harvest of a crop of “Outredgeous” red romaine lettuce from the Veggie plant growth system that tests hardware for growing vegetables and other plants in space. The astronauts will clean the leafy greens with citric acid-based, food safe sanitizing wipes before consuming them. They will eat half of the space bounty, setting aside the other half to be packaged and frozen on the station until it can be returned to Earth for scientific analysis. NASA’s plant experiment, called Veg-01, is being used to study the in-orbit function and performance of the plant growth facility and its rooting “pillows,” which contain the seeds. NASA is maturing Veggie technology aboard the space station to provide future pioneers with a sustainable food supplement – a critical part of NASA’s Journey to Mars. As NASA moves toward long-duration exploration missions farther into the solar system, Veggie will be a resource for crew food growth and consumption. It also could be used by astronauts for recreational gardening activities during deep space missions. The first pillows were activated, watered and cared for by Expedition 39 flight engineer Steve Swanson in May 2014. After 33 days of growth, the plants were harvested and returned to Earth in October 2014. At NASA’s Kennedy Space Center in Florida, the plants underwent food safety analysis. The second Veg-01 plant pillows were activated by Kelly on July 8 and grew again for 33 days before being harvested. The seeds had been on the station for 15 months before being activated. The Veggie system was developed by Orbital Technologies Corp. (ORBITEC) in Madison, Wisconsin, and tested at Kennedy before flight. Veggie, along with two sets of pillows containing the romaine seeds and one set of zinnias, was delivered to the station on the third cargo resupply mission by SpaceX in April 2014. 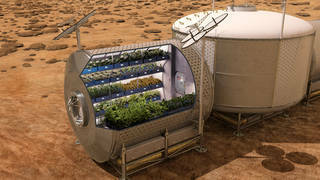 NASA plans to grow food on future spacecraft and on other planets as a food supplement for astronauts. Fresh food, such as vegetables, provide essential vitamins and nutrients that will help enable sustainable deep space pioneering. The collapsible and expandable Veggie unit features a flat panel light bank that includes red, blue and green LEDs for plant growth and crew observation. Using LED lights to grow plants was an idea that originated with NASA as far back as the late 1990s, according to Dr. Ray Wheeler, lead for Advanced Life Support activities in the Exploration Research and Technology Programs Office at Kennedy. Wheeler worked with engineers and collaborators to help develop the Veggie unit from a Small Business Innovative Research project with ORBITEC. Dr. Gioia Massa is the NASA payload scientist for Veggie at Kennedy. Massa and others worked to get the flight unit developed and certified for use on the space station. The purple/pinkish hue surrounding the plants in Veggie is the result of a combination of the red and blue lights, which by design emit more light than the green LEDs. Green LEDS were added so the plants look like edible food rather than weird purple plants. Wheeler, Massa and Dr. Gary Stutte, all from Kennedy, previously investigated similar experiments to grow plants in the Habitat Demonstration Unit at NASA’s desert test site near Flagstaff, Arizona, in 2010 and 2011. Wheeler said Veggie will help NASA learn more about growing plants in controlled environment agriculture settings. Similar settings include vertical agriculture, which refers to stacking up shelves of plants that are grown hydroponically and then using electric light sources like red and blue LEDs. This kind of system is popular in some Asian countries and beginning to grow in the U.S.
“There is evidence that supports fresh foods, such as tomatoes, blueberries and red lettuce are a good source of antioxidants. Having fresh food like these available in space could have a positive impact on people’s moods and also could provide some protection against radiation in space,” Wheeler said. After the first crop of lettuce was returned from the space station, Massa began working with a team of flight doctors and NASA safety representatives to get approval for the crew to eat the produce. “Microbiological food safety analysis looks very good on the first Veg-01 crop of romaine lettuce,” Massa said. Besides the nutritional benefits, could growing fresh produce in space also provide a psychological benefit? Alexandra Whitmire, a scientist at NASA’s Johnson Space Center in Houston is involved in research to answer that question. Whitmire is the Behavioral Health and Performance Research scientist for NASA’s Human Research Program. Her team supports research related to reducing psychological risks on a Mars mission. “The Veggie experiment is currently the only experiment we are supporting which involves evaluating the effects of plant life on humans in space,” Whitmire said. Her team is focused on crew behavioral conditions, performance reduction, and team communication and psychosocial adaption. The countermeasures could include things like meaningful work. Habitat-related modifications also could include plant life. Whitmire said Earth studies have shown plants are associated with well-being and optimal performance. Plants potentially could serve as a countermeasure for long-duration exploration missions. Having something green and growing–a little piece of Earth–to take care of when living and working in an extreme and stressful environment could have tremendous value and impact. “The farther and longer humans go away from Earth, the greater the need to be able to grow plants for food, atmosphere recycling and psychological benefits. I think that plant systems will become important components of any long-duration exploration scenario,” Massa said. The system also may have implications for improving growth and biomass production on Earth, thus benefiting the average citizen. Massa said many of the lessons NASA is learning with Veggie could be applied in urban plant factories and other agriculture settings where light is provided by electrical light and water conservation is practiced. The team at Kennedy and Johnson hope that Veggie and space gardening will become a valued feature of life aboard the space station and in the future on Mars. For more information about Veggie, visit here. Watch this video to learn more about growing plants in space. This entry was posted in SPACE and tagged International Space Station. Bookmark the permalink.